High Cholesterol? How to Choose Healthy Foods while Eating Out! • If you are a regular customer to that restaurant, decide what to order before seeing the menu. This will help you avoid any tempting starter or unhealthy food. If you are new to the place, take enough time out to go through the menu to carefully choose healthy foods. • Avoid foods that say buttery, cream of, fried, pan fried or shallow fried. Instead go for steamed, broiled, grilled, stir-fried, or roasted. • If you are in a group, order first so that you will not be influenced by other's choices. • Try removing all visible fat from your food by avoiding red meats and processed meats and go for sea foods and lean cuts of chicken which is not fried. • If you are not familiar with a new food, ask the server about the ingredients without hesitation instead of ending up eating a food that you aren't supposed to eat! • Undoubtedly salads can be replaced for appetizers. But choose a healthy salad without dressings to reap the goodness of it. Plain cut vegetables with a pinch of black pepper, rock salt and lemon juice can be the best way to start your meal. • Go for cut fruits as desserts instead of a gulab jamoon or an ice cream! 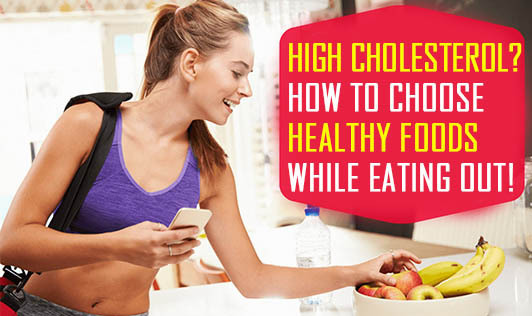 Remember, it is not just the calories that can harm your cholesterol levels but the type of fat, the type of preparation and the quantity is what shows up on your cholesterol reports.